Location: Zdravets Wellness & Spa Hotel (Grand Hotel Abeer) is situated right in the heart of the famous spa and wellness resort Velingrad, just 500 m away from the bus station and the railway station. Accommodation: Zdravets Wellness & Spa Hotel (Grand hotel Abeer) offers 18 single rooms, 3 single interconnected rooms, 3 double interconnected rooms, 16 double rooms, 30 luxurious rooms, 8 apartments and 1 presidential apartment. All rooms offer air conditioning, TV, mini bar, telephone, bathroom with bath tub and shower cabin with mineral water. The hotel offers 4 rooms for people with disabilities and asthma. All rooms and apartments on the 4th floor of the hotel are for non smokers. Wine and dine: Zdravets Wellness & Spa Hotel (Grand hotel Abeer) is a five storey modern building. The complex offers an excellent restaurant with a summer garden and a capacity for 215 tourists, Vienna confectionery for 50, lobby bar and pool bar. Swimming pools: Zdravets Wellness & Spa Hotel (Grand hotel Abeer) offers an open air and indoor swimming pools with mineral water, outdoor Jacuzzi and fitness hall for the complete relax of all guests. Meeting facilities: Zdravets Wellness & Spa Hotel (Grand Hotel Abeer) offers excellent conditions for holding business events or conferences. 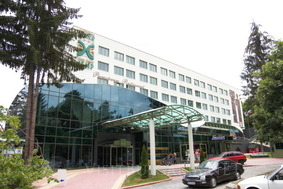 The conference hall in the hotel has a capacity for 120 visitors. All necessary technical equipment is provided upon preliminary demand.